Shake Shack is a casual chain of burger restaurants that originated in New York City and now has locations all over the world. Their menu is pretty simple. They serve a few different types of burgers, fries, and some cold treats made with their special frozen custard. When my family went to New York years ago, one of our fondest memories were the burgers from Shake Shack, so returning on our latest trip was a no-brainer. The restaurant was really busy at dinner time and lined up out the door, but the line moved pretty fast and we were able to find seating after waiting for a few moments. I had heard a lot of hype about the shack stack burger, so I already knew what I was going to order before I came here. The shack stack is a cheeseburger with lettuce and tomato that is topped with a fried portobello mushroom. The portobello mushroom is also stuffed with muenster and cheddar cheese. This burger is incredibly cheesy and delicious. There was so much cheese everywhere it was oozing out into a delicious mess. The fried portobello mushroom really added a nice crunch to the burger, much like an onion ring, but with a more meaty texture. The beef patties are always cooked medium, so the meat was really tender and juicy. The bun was also perfectly soft and light and it managed to not get too soggy. The last time I went to Shake Shack they had different fries that were reminiscent of frozen store bought french fries. I was happy to see that have really improved them since then. The fries are cut really thin with the potato skins still on and they were nice and crispy. They were also heavily salted, so you definitely don’t need to add salt. Shake Shack is also known for their custard, which they serve in cups and use to make their milkshakes. Their flavour of the day that I tried was chocolate cheesecake. The custard was incredibly smooth and it had the consistency of frozen butter. It was really rich, creamy, and delicious. If you are an ice cream fan then I would highly suggest trying some. 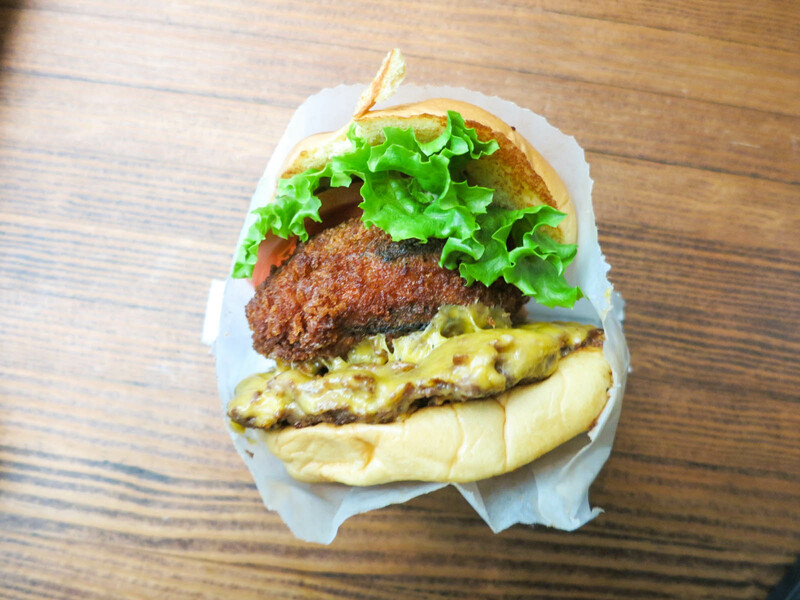 Shake Shack is definitely a must-do if you enjoy a good burger. The shack stack is up there with being one of the best burgers I have ever eaten and it is a pretty affordable meal. If you find yourself in New York City and looking for a delicious convenient meal, Shake Shack is worth checking out. Yes, you must try the shack stack.